Picked up for pennies yesterday on the off- chance but when layers of dirt were removed it looked new. Surely its modern isnt it? Ive tried searches for new slag glass but no results. Looks ok to me and the foot seems to have ok wear also. The slag glass that I have seen all has / had a good shine to it. 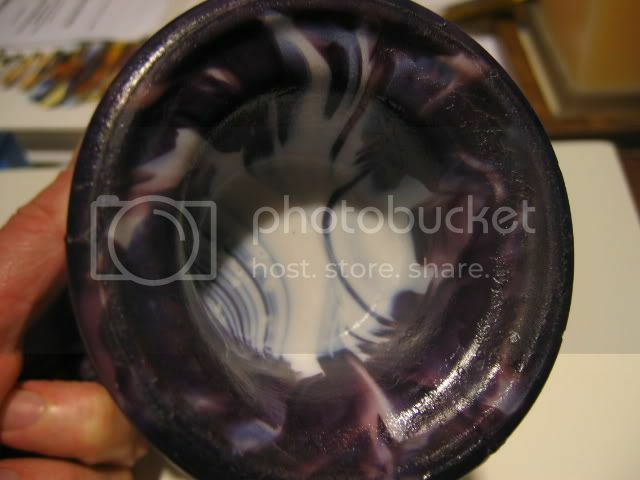 Take a look at a few items I show in my own site, particluarly the ones with white marbling. Some "slag" was manufactured in the 60's by Davidsons but this doesn't look like theirs from that period. There was also some other copies made but I dont remember the source. Anyway the crispness and the "flow" of colour on your piece looks much more in keeping with that produced late 19th C.......certainly more than a few coppers worth....I take it you've had a good feel around the piece for an embossed makers mark?? Davidson 1964 Marble glass is quite rare; I have only had four examples through my hands, a Jobling No. 2598 Deco random geometric ashtray still showing the Rd. No. 800714 from the mould's days at Sunderland, a 296 Fan vase, a Chippendale pedestal jug, and a 292 bowl, all, if I remember correctly, marked with one of two sizes of a lion over crown trademark from newly made punches, slightly more angular than the impression from the original C19 trademark punch. In my opinion the white glass element of Marble is not as opaque as the white glass used for the C19 slag glass. It could be a white translucent lightshade glass. It is well worth looking out for. Look for Jobling/Greener flint (non-Pyrex) patterns and all Davidson patterns. Old Victorian moulds could well have been used for Marble, perhaps still marked with the old original trademark. Distinguishing them could be rather problematic, unless you have one of each side by side for comparison! I am sure that most Marble is unrecognised. See http://www.cloudglass.com for more details and photographs. Thank you for all your observations and information. I certainly agree that after looking at some of your examples the colours and marbling seem fine . Re: Thanks for your replies. Unless I am wrong and also been looking at a lot of duffs in the past 20 years the finish you describe is not that uncommon....and that goes for other types of pressed glass as well. Some of the "finishing" on a number of pieces of Davidsons cloud glass I have in fact contradicts the word itself....some of it is almost dangerous with its raw edges and seams. Thats the kind of finishing here- none at all ! I'm glad I spent the 50p now as it looks as though it is most likely a genuine late C19th piece. Page created in 0.553 seconds with 28 queries.